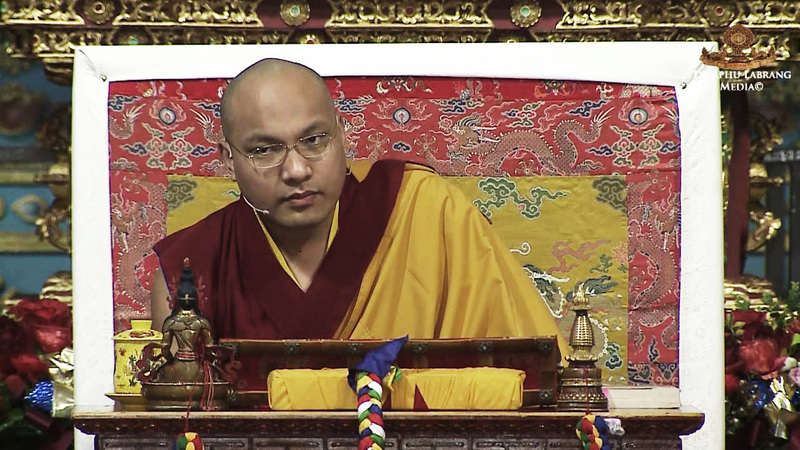 SOURCE – As part of the 17th Gyalwang Karmapa’s teachings on Gampopa’s “Jewel Ornament of Liberation” during the 2nd annual Arya Kshema Winter Gathering for Kagyu Nuns, the 17th Karmapa has made it unmistakably clear to a large audience of both ordained and lay Vajrayana practitioners – the first job in developing compassion is not eating meat. In terms of eating meat – it’s is said that for beginners for training in compassion, the very first task if we are going to develop actual authentic compassion, the very first task that we need to do it is to not eat meat. This is the first step to start developing compassion. It is said in the Mahaparinirvana sutra, if the monks, in a time of famine, if they only receive meat in their alms bowls – should they eat it? It is then said, that they may eat it if they are able to see it as their own child’s flesh. Here is it said there is an allowance to eat meat in a time of famine. If it’s saying there is an allowance then, it’s not necessary to say that it is prohibited at all other times. Recorded at Tergar Monastery, Bodhgaya, India. January 8-23, 2015.